Fantasia dress is a sparkling organza and tulle bridal gown featuring a lace illusion neckline on a sweep train ball-gown skirt with gentle bodice boning. The back of the gown is lace illusion with satin buttons, and hidden zipper up back. Bodice accented by glittering rows of sequins & skirt has lace applique designs. Comfortable for dancing! Dress was worn at my wedding in August 2016 & immediately professionally dry cleaned and preserved in a sealed keepsake box. 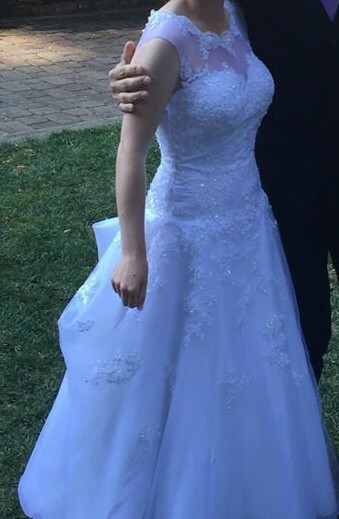 Custom altered: bra cups added, waist taken in, bustle buttons & loops added to train, front length shortened to floor length-- I'm 5'2" and wore 2" heels so dress was just floating above the ground-- would fit a 5'4" or 5'5" person perfectly in length. Original measurements: bust 36 in, waist: 29 1/2 in, hips: 39 1/2 in. Professionally tailored at the waist & hips a bit smaller (bust is same, 36 in) altered waist is 28in, hips approx 37 in-- the hips measurement may be off? Please feel free to ask any further questions, and I can also send pictures of the dress in keepsake dry cleaning box. Kept in a clean, non smoking home. Once you send a message, Lisette can invite you to purchase the dress.